The Arielle gown is for our relaxed, romantic brides, those who want to feel the luxury of silk against their skin, in an undemanding, modern style gown. The dress suited our relaxed but elegant Byron Bay wedding. It was soft on the skin and felt amazing to wear. I was comfortable yet felt like a gorgeous modern bride. The top drapes elegantly into a low V neckline, which crosses over slightly at the centre front, with a deep V back also. The Arielle skirt has been altered to taper in around the hip and falls from the upper thigh, with a centre front split and a modern trim detail in the centre front of the skirt. There is a skin colour silk backing the trim so that it remains modest. The train was extended at an additional cost. it is now 65cm as you can see in the photos. 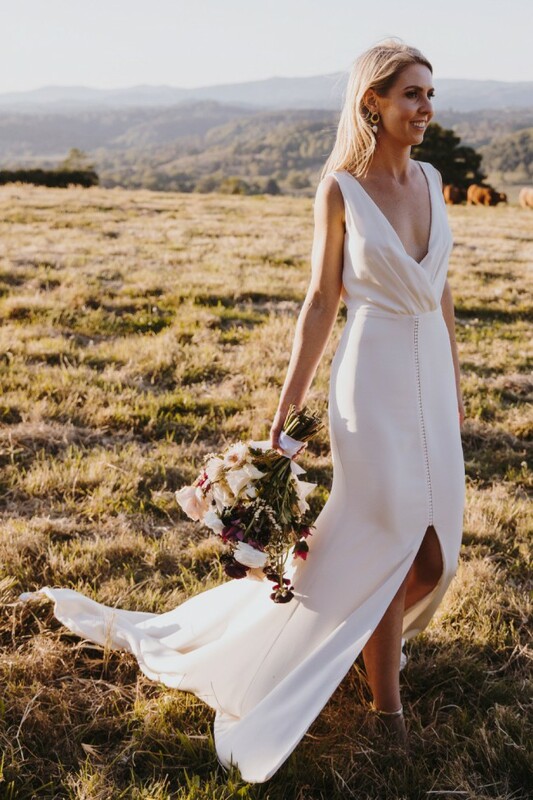 I purchased the Arielle Dress from The Bridal Atelier in Prahran, Victoria in 2018. The dress has been professionally drycleaned at Syndal's Bridal Dry Cleaning in Armadale, Melbourne. I also have the floor length Molly Veil available at an additional $200. This has also been drycleaned. This gown was originally purchased and a size 8-10 but with alterations it would suit a size 6-8. It has been taken in at the chest, waist, shoulders and mid thigh. It was taken in at the thigh to create a subtle fit and flaire/trumpet look as the skirt was quite straight fom the hips. Cups have been added but these can be removed if required. It would suit a small bust A-B cup. A hook has been added at the back for a French Bustle look (underneath bustle) as well as a wrist hoop to lift the dress up off the ground. Necessary when walking and holding your bouquet.